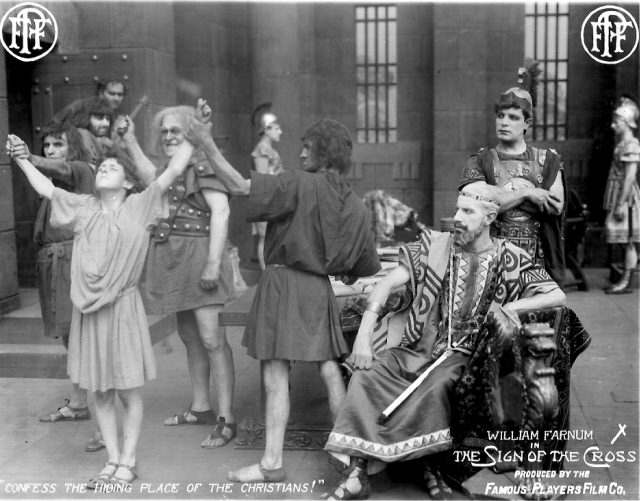 An exclusive film exhibited in Ireland in November 1914: The Sign of the Cross (US: Famous Players, 1914). Image: The Silent Film Still Archive. The published information on film distribution in Ireland in the 1910s is useful in general, but it lacks the detail to say something about how Irish cinemas acquired films in, say, November 1914 (Condon, Early Irish Cinema, 215-17; Rockett 38-41). However, the trade press, particularly the London-based Bioscope, and the local papers that month give some more specific details. By this time, exhibitors no longer bought films outright, as the – much smaller number of – exhibitors in the 1900s had. Films were rented from distributors or renters, and the distribution business in Ireland and Britain was based in London. The sea crossing was an issue for distributors into Ireland, particularly as military operations changed the priorities on the transport of goods in 1914. However, such issues were more easily negotiated by the film distributors who had offices in Ireland or worked through Irish agents. Ad for Gaumont’s Chrono projector; Bioscope 6 Aug. 1914: xix. This ad appeared just as war was breaking out; even a few weeks later, it would not have been acceptable in the context of discussions of severing links with enemy companies as part of the war effort. “I dropped up the other day to see Mr. Young of the Gaumont Company, Lord Edward Street, Dublin,” revealed Irish correspondent Paddy in the Bioscope in early November 1914 (Paddy, 5 Nov.). Since opening early in 1913, the luxuriously appointed Dublin branch office of Gaumont in London sold the company’s popular Chrono projector, held trade viewings in a dedicated screenings room of the films it distributed, and shot many local topical films since its first ones in June 1913, such as The Launch of the Britannic and a film of a hurling match between Kilkenny and Cork (13 Nov.). Paddy noted that “Mr. Young seemed pleased with how matters were progressing, and he expressed the opinion that the falling off on account of the war was practically negligible” (5 Nov.). A year earlier, Paddy had found Young’s predecessor also pleased with business, including the fact that “[a] great many more Irish theatres have thrown in their lot with the Gaumont Film Service” (13 Nov.), including the Grand in Dublin’s O’Connell Street (Paddy, 24 Jul. ), Limerick’s Gaiety Bijou (7 Aug.), and Belfast’s Princess Picture Palace (“Jottings,” 12 Nov.). Gaumont did not have Irish distribution to itself. In November 1914, the Ideal Film Renting Company set up their Dublin office at 40 Dawson Street, Dublin. “There is little doubt that by opening in Dublin,” opined Paddy, “The Ideal Company have stimulated competition and made it possible for exhibitors to make a better selection on the spot” (5 Nov.). Among the exclusive films that Ideal handled were Danish production company Nordisk’s For the Sake of a Man (1913) and Her Hour of Temptation (1914), as well as Joan of Arc (Italy: Savoia, 1913), for which “[s]pecial posters are available” (ibid.). Other London-based distributors relied on travelling salespeople or on the Irish-based companies that acted as their agents. In the week of 5 November, Paddy also “ran into Mr. Hagan, the Scottish and Irish representative for Messrs. Ruffells’ exclusives,” who “had secured bookings running to over £350” (ibid.). Norman Whitten’s General Film Supply (GFS) appears initially to have been a branch of the London-based General Film Agency, and although Whitten was better known as a maker and distributor of his own local topicals, GFS also distributed the films of other companies. Some larger Irish cinema chains, such as James T. Jameson’s Irish Animated Picture Company, had their own buyers in London (Condon, “Limelight,” 253). An “Item of Interest” in the Bioscope on 19 November informed trade readers that the Palace in Newtownards, Co. Down, had appointed Lillah Dawson as its film reviewer: “Miss Dawson has recommended the features booked at this hall during the past few weeks, and as a result the seating accommodation and the cork lino have come in for some severe wear, strong evidence that this lady weighs up a subject in a capable and experienced manner” (“Film Reviewer Appointed”). Depending on the nature of the programme at the picture house or houses concerned, a representative such as Dawson might have had a more or less arduous job. Something has already been said here about the content of the film programme, particularly in regards to the number and length of the films and the length of the programme itself. The dominant practice in cities and towns was for picture houses to change their programmes twice a week, on Monday and Thursday, with a third change for those picture houses that held a Sunday licence. As a result, most films had a three-day run, with the possibility of holding over an especially attractive film – most likely, an “exclusive” – for the second half of the week, in which case the other items on the programme were usually changed. A run of longer than six days for any film was really exceptional. Shorter runs were possible. In early November 1914, Dublin’s Rotunda advertised the fact that beginning on 9 November, it would have three changes in the week, which for this venue with no Sunday licence meant two-day programmes, with changes on Monday, Wednesday and Friday. “Large audiences,” a preview in the Evening Telegraph predicted, “are sure to appreciate this move on the part of the management, who certainly spare no expense in catering for the entertainment of their patrons” (“Rotunda Pictures”). 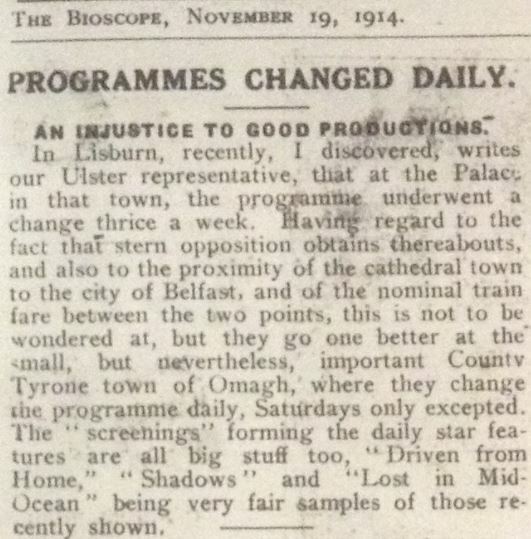 An extract from a Bioscope article discussing daily programme changes at the Omagh Picture Palace; 19 Nov 1914: 789. 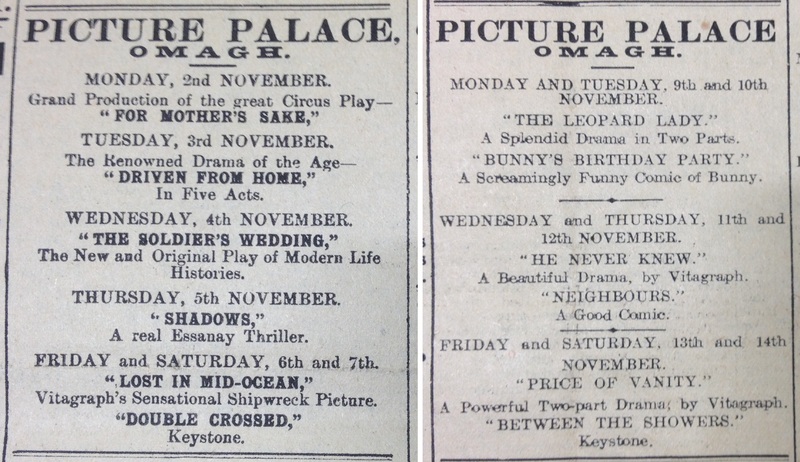 Ads for Omagh Picture Palace showing variations in programming. Tyrone Constitution 30 Oct. 1914: 4 and 6 Nov. 1914: 4. The trade anxieties manifest in this advice about the effective rhythms of advertising had little to do with the Picture Palace’s choice of films but more with the number of films required. Driven from Home (1914), Shadows (US: IMP, 1914) and Lost in Mid-Ocean (US: Vitagraph, 1914) “want a lot of beating as star subjects. Why not, therefore give them an opportunity to prove their value?” (ibid.). Indeed, assuming a complete daily change of programme, the Picture Palace would likely have shown between 25 and 50 films a week, depending on their length. This suggests that the management had a very different view than the Bioscope of the nature of the entertainment it provided. The competing interests of film producers and exhibitors were shown in late November 1914, when the Bioscope cited the call by Carl Laemmle, head of the US production company Universal, to “cheaper American theatres to raise their prices of admission [to cover] the growing cost of film production” (“Trade Topics”). The management of the Omagh Picture Palace appears to have paid little attention to the quality of individual films and focused instead on audience choice and creating a constituency of daily cinemagoers. First ad for Dublin’s Sandford Cinema; Evening Herald 3 Nov. 1914: 4. Omagh’s abundance of films seems to parallel a more general return of optimism to the Irish film trade in late 1914, which saw the opening of some new picture houses. 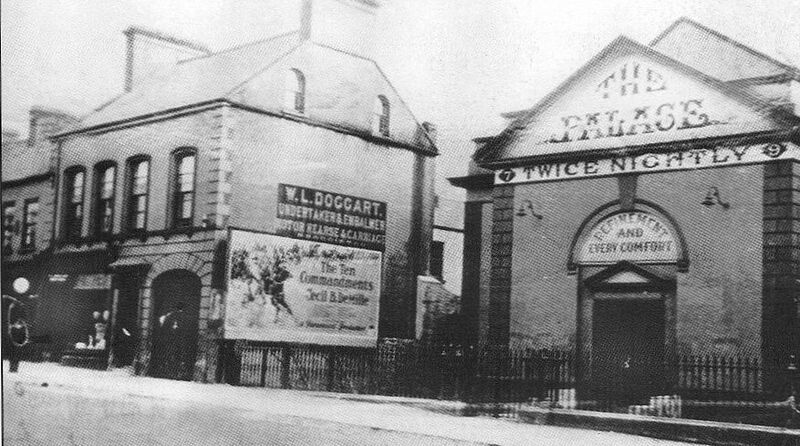 “That little thought is here given to the approach of lean days,” “Jottings” observed, “is evident from the fact that a new hall is now in full swing in Lurgan, under the direction of Mr. Hewitt”, as well as from the enlargement of Lisburn’s Electric Palace, and the equipping of new picture houses in Coleraine and Belfast’s Corn Market (5 Nov.). In Dublin, the Sandford Cinema opened on 2 November with little newspaper publicity. The first notice was a brief review in the Evening Herald the following day, alongside reviews of the Kinemacolor pictures at the Theatre Royal, the Phoenix Picture Palace’s screenings of The Sign of the Cross (US: Famous Players, 1914) – the most heavily publicized film in Ireland in late 1914 – and the Masterpiece Picture House. The review did not give the titles of the films that “were so much admired at the opening show,” focusing instead on the decor of the building that “is sumptuously fitted up interiorally, the costly furniture being supplied by Clery and Co., Ltd.” (“New Picture Theatre in Ranelagh”). Paddy later revealed the opening “star films” to have been England’s Menace (Britain: London, 1914) and The Village of Death (19 Nov.). No other newspaper coverage of the Sandford appeared in the first week of November, but in the following week, several papers carried ads for In the Bishop’s Carriage (US: Famous Players, 1913), with Mary Pickford, for the first three days and The Wheels of Destiny (US: Majestic, 1914) for the last three. Managed by John and P.W. Whittle, the Sandford was “quite a high-class” picture house, “replete with all modern conveniences,” including Gaumont projectors and the “indirect system of lighting” in the auditorium (Paddy, 19 Nov.). Paddy found the building to be “a beautiful structure, with a fine flight of steps leading up to the pay-box. The entrance doors are finished in stained glass,” and inside, there was a “considerable rake to the floor, thus enabling all patrons to have a full view of the screen” (ibid.). Despite this focus on the experience of all cinemagoers, the audience was to be divided based on ticket price both outside and inside the premises. “The building stands on a corner site, thus enabling the 3d. entrance to be distinct from the 6d. and 1s., [and once inside, the] 1s. seats are distinguished from the 6d. by neat squares of crochet work on the backs” (ibid.). The management did not, however, show the same attention to detail in securing the required official documents, and it was prosecuted on 20 November for operating without a cinematograph licence (“Sandford Cinema Theatre”). Nevertheless, Inspector Gray of the Dublin Metropolitan Police testified that the premises were “extremely comfortable and suitable in every way for a picture theatre. The pictures he had seen were excellent” (ibid.). Elsewhere – and almost everywhere – war films remained popular. When Dublin’s Daily Express reviewed In the Hands of the Kindly Dutch at the Rotunda in early November, it emphasized the personal response many in the audience might have made to topical films about the war. The film “shows the division of the Naval Brigade who were interned in Holland after the surrender of Antwerp , and was so clear that anyone could recognise a relative or friend” (“The Rotunda Pictures”). In the same week, the Kinemacolor matinees at the Theatre Royal were providing colour films of the front. The fact that these films were shown in such a large theatre rather than in one of the smaller picture houses indicates that the management expected considerable interest in them, and it went out of its way to create further publicity. “On the kind invitation of the management,” the Express reported, “a number of wounded soldiers attended the [Kinemacolor war films] yesterday, and received quite an ovation from the large audience. Others who were unable to attend will be present this afternoon” (“Theatre Royal”). Evening Telegraph 28 Nov. 1914: 6. Although the Express observed that “[t]he audience yesterday was unreservedly enthusiastic concerning the display” of war pictures at the matinee, certain members of the audience at the Theatre Royal were neither enthusiastic nor reserved about patriotic displays at the theatre’s live evening show (“Picture Matinees”). On 2 November, a group of young men wearing republican badges protested by booing, hissing and groaning when, during one musical number, several Union Jack flags were unfurled and the orchestra played “Rule Britannia.” When 18-year-old Thomas Smart refused to stop, he was arrested and fined 40 shillings in court (“Scene in Theatre Royal”). Ad for two Irish-themed films from the US production company Domino; Bioscope 12 Mar. 1914: xviii. Smart and his fellow protestors might have been more appreciative of the Irish week run by the Masterpiece at the end of November. The main film was True Irish Hearts (US: Domino, 1914), supported by The Filly (US: Domino, 1913), Rory O’More (US: Kalem, 1911), The O’Neill (US: Kalem, 1912), films of Irish scenic landscapes and a topical of the Castlebellingham Feis and Louth Volunteers. During the previous week, manager Cathal McGarvey “had appeared personally at each performance during the week in his original humorous monologues, and these met with a great reception, there being no better humorous reciter in Dublin than Mr. McGarvey” (Paddy, 19 Nov.). For the Masterpiece’s Irish Week, however, McGarvey allowed popular baritone W.A. Sheehan to enhance the live musical accompaniment by singing Irish songs (“An Irish Week”). These kinds of Irish Weeks were not new, but they were facilitated by the fact that such producers as Domino and Kalem were continuing to make Irish subjects. The Domino titles were new ones, available through Western Import since March and April 1914, but the Kalem ones were older titles that required that a distributor – in this case, the Express Film Service – hold on to them for such events. Condon, Denis. Early Irish Cinema, 1895-1921. Dublin: Irish Academic, 2008. —. “Limelight on the Colleen Bawn: Resisting Autoexoticism in Provincial Irish Picture Houses in the Early 1910s.” Les cinémas périphériques dans la période des premiers temps. Peripheral Early Cinema: Domitor 2008. Perpignan: PU Perpignan, 2010. 245-255. “Dublin and District: Ranelagh’s New Picture House.” Irish Independent 10 Nov, 1914: 4. “Film Reviewer Appointed.” Bioscope 19 Nov. 1914: 706. “An Irish Week at the Masterpiece.” Evening Telegraph 28 Nov. 1914: 6. “Jottings from Ulster.” Bioscope 13 Nov. 1913: 589; 5 Nov. 1914: 543; 12 Nov. 1914: 647. “New Picture Theatre in Ranelagh.” Evening Herald 3 Nov. 1914: 4. Paddy. “Pictures in Ireland.” Bioscope 24 Jul. 1913: 267; 7 Aug. 1913: 413; 13 Nov. 1913: 601; 5 Nov. 1914: 525; 19 Nov. 1914: 736. “Picture Matinees at the Theatre Royal.” Daily Express 3 Nov. 1914: 8. “Programmes Changed Daily: An Injustice to Good Productions.” Bioscope 19 Nov 1914: 789. Rockett, Kevin and Emer. Film Exhibition and Distribution in Ireland, 1909-2010. Dublin Four Courts, 2011. “The Rotunda Pictures.” Daily Express 3 Nov. 1914, 2. “Rotunda Pictures.” Evening Telegraph 7 Nov. 1914: 6. “Scene in Theatre Royal: A Row in the Gallery.” Daily Express 4 Nov. 4 1914: 3. 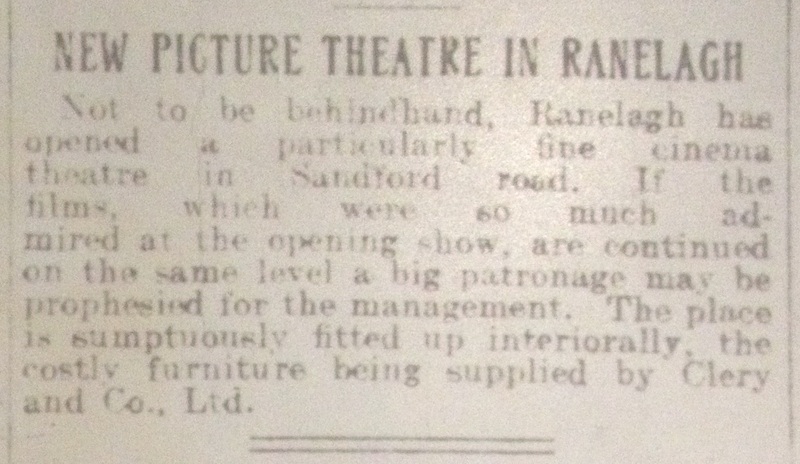 “Sandford Cinema Theatre.” Evening Telegraph 21 Nov. 1914: 4. “Trade Topics.” Bioscope 26 Nov. 1914: 821. These ads appeared in the Dublin Evening Mail 7 Aug. 1914: 2; and 18 Aug. 1914: 2. “It is ever so much more a patriotic thing to go down the quays and give the soldiers a good send-off than it is to sit in a darkened picture house watching, perhaps, ‘shadow soldiers’ flickering on a screen,” reported Paddy, the Ireland correspondent of the British cinema trade journal Bioscope in August 1914 explaining the falloff in attendance at Dublin’s picture houses at the start of the Great War. “[T]he fact that the Lord Mayor of Dublin had to publicly ask the people through the medium of the Press, to refrain from causing a block on the quays and assist in getting the soldiers embarked more expeditiously shows how matters stand” (Paddy, 13 Aug., 673). Mobilization affected the cinema and its relationship with the popular audience in various ways. Those who lined the Dublin quays, Paddy suggested, were particularly the popular audience who would otherwise have occupied the picture houses’ cheapest – usually three-penny or 3d. – seats. Although Frederick Sparling, manager of Phibsboro’s Bohemian Picture Theatre, reported brisk business, “he experienced a great falling off in the attendances at the 3d. seats, and he expected that receipts generally would show a drop for a little time” (ibid). Paddy claimed that the effect in Ulster was quite different, with the outbreak of the war bringing unionist and nationalist audiences together in the face of a common enemy. “[T]he one-time rivals now fraternise,” he observed, “and quiet, law-abiding and gaiety-loving citizens are now taking their pleasures with less sadness than had been their wont during the two gloomy years from which Ireland has just emerged” (Paddy, 13 Aug., 675). Unfortunately, this somewhat unlikely harmony would be short-lived because the difficulties of procuring enough flax and other raw material for Ulster’s factories would mean that mill workers, “the backbone of the support of the cinema in Ulster as in other manufacturing centres,” would be placed on half-time working at half-pay, leaving “nothing to spend on amusements of any description” (ibid). Actuality films of the war appeared on the cinema programme alongside such fiction film as D. W. Griffith’s Judith of Bethulia (US: Biograph, 1914). Dublin Evening Mail 24 Aug. 1914: 2. Nevertheless, Irish picture houses attempted from a very early point in the war to provide shadow soldiers on the screen for their audiences, and not only working-class ones. On 7 August 1914, the Dublin Evening Mail carried the first of a series of unusually large ads for the Picture House, Grafton Street and the Picture House, Sackville Street showing films depicting “the latest developments of the War, day by day.” Both of these cinemas were owned by the London-based chain Provincial Cinematograph Theatres, which also ran the less-salubrious Volta in Mary Street and Belfast’s Picture House, Royal Avenue. The company promoted its venues – and particularly the recently renovated and extended Grafton on Dublin’s most prestigious shopping street – as offering luxuries suitable for prosperous city-centre shoppers. Strollers who stopped into the Grafton’s public café might be induced to see the war pictures by a sign that indicated which of the six-to-eight films typically on a cinema programme was currently playing in the auditorium. 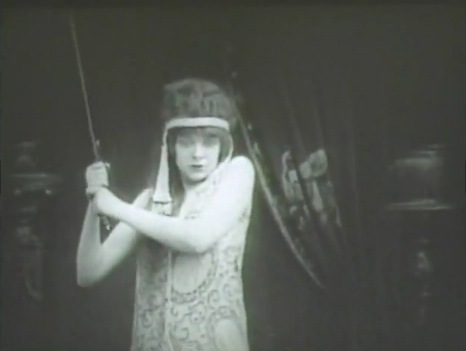 Judith (Blanche Sweet) prepares to behead Holofernes in Judith of Bethulia. Although such passersby or Evening Mail readers arrested by the prominent ads continued to be offered a programme of films after the outbreak of hostilities, they seem to have been presented with an overwhelming number of war-themed films. The Grafton featured England’s Menace (Britain: London, 1914), a “stunning naval drama,” for the week beginning 10 August, the six-day run representing twice the usual period for which a film was shown. For the first three days of the following week, the Grafton exhibited Maurice Elvey’s In the Days of Trafalgar (Britain: British and Colonial, 1914), supported by a programme that included the first part of the British Army Film (Britain: Keith Prowse, 1914), the second part of which ran in the latter half of the week on a bill headed by The Spy, or The Mystery of Capt. Dawson (1914), a detective drama involving the stealing of plans for a new quick-firing gun. 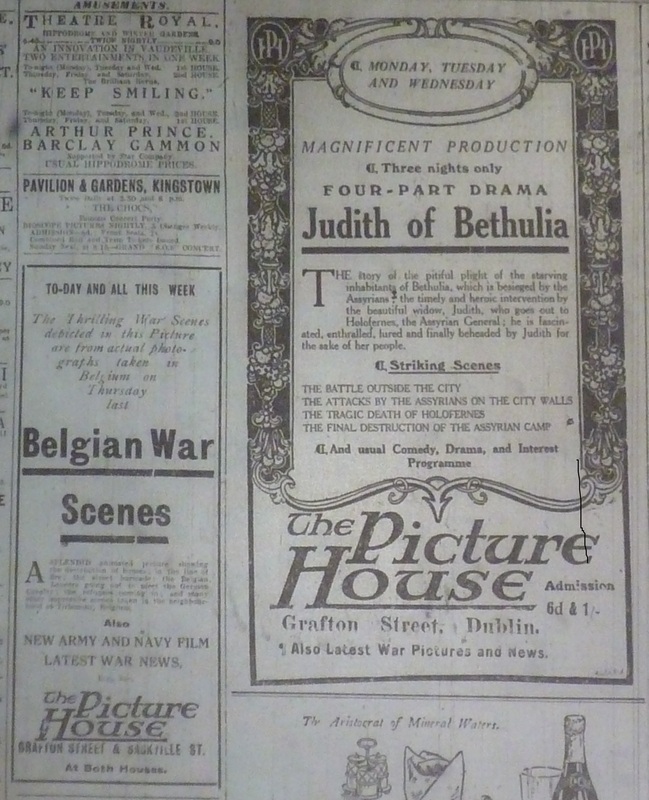 The Belgian War Scenes advertised on 24 August were said to have come “from actual photographs [i.e., films] taken in Belgium on Thursday last,” and these played on the programme with D. W. Griffith’s Judith of Bethulia (US: Biograph, 1914), an adaptation of the biblical Book of Judith’s story of war and decapitation. 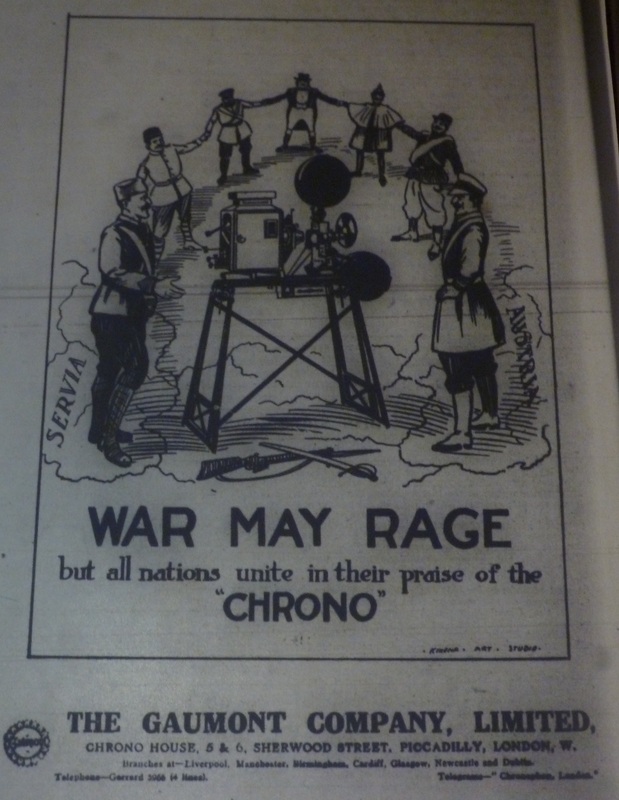 Provincial was not the only cinema proprietor to show actual war footage – Dublin’s Rotunda, Phoenix and Bohemian all advertised their latest war films, as did many others in newspapers or through more ephemeral forms such as posters and handbills that no longer survive. Provincial, however, made a special effort to exhibit the actualities in programmes with other kinds of war-themed films to cater for – or indeed, help to create – a patriotic war fever. Given the recentness of the war, none of the fiction films just mentioned concerned the current conflict with Germany, nor did the British Army Film, a documentary about ordinary life in the army that was made before the war and that had attracted a protest in March. There was nothing new in popular culture assembling and re-presenting pre-existing elements in a new combination that served the prevailing ideology, particularly at a time of crisis. The live music that accompanied silent film in picture houses of the 1910s could add further jingoism. There were precedents for the use of film in war-time patriotic shows as early as the Boer War, but the popular audience in many parts of Ireland had often been vocally resistant to such anti-Boer/pro-British jingoistic shows (Condon). What had changed between the turn of the century and the 1910s, however, was cinema’s place within the mediascape in Ireland as elsewhere. 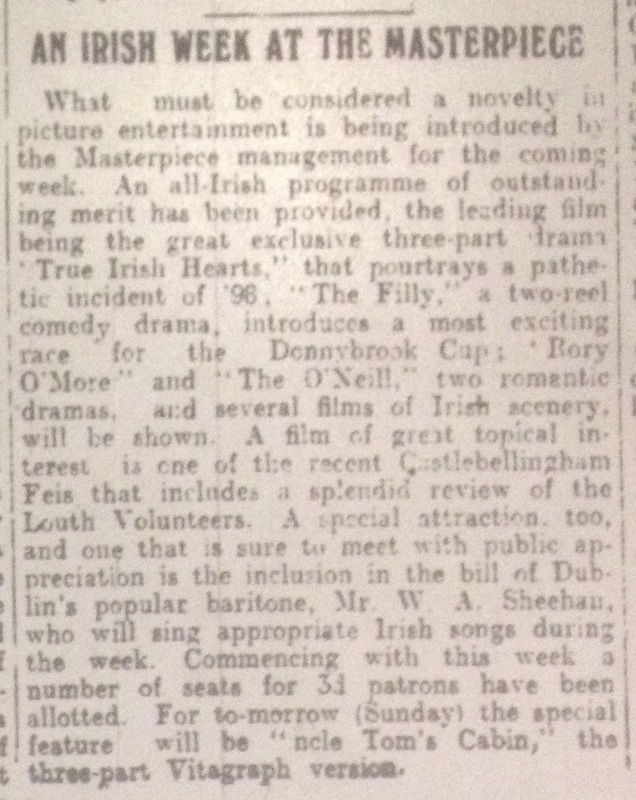 By 1914, Ireland had a large number of picture houses that provided news alongside dramatic entertainment. Although picture houses could not match the newspapers’ detailed coverage of topical events, newsreels from the front provided by such companies as Pathé and Gaumont offered something the press could not: moving images of battle sites and the people who fought in the war. Because newsreel scenes recorded on film needed to be physically transported from the front, their newsworthiness had dissipated. Some picture theatres, including the Grafton and Sackville, entered into agreements with telegraphic wire services to offer instantaneous messages during shows, a phenomenon that bears resemblance to a Twitter feed. One ad for these picture houses informed the public that “[a]rrangements have been completed with the Central News Agency for a complete service of telegrams from the Front, to be supplied to this Theatre. As the news arrives it will be immediately thrown on to the screen” (“The War”). he has just acquired some curious and too little known facts about the Roman Empire. It would appear that the Caesars were in the habit of decorating their apartments with busts of Dante (which certainly showed remarkable foresight on their part), while their consorts sought relaxation by perusing printed volumes, handsomely bound. Verily, to live is to learn, but seeing is not always believing. Seeing the past – or present – in the form of the “cineanachronisms” provided in the picture houses was not to be believed by this canny man about town. At least not always. By the outbreak of the war, cinema had become a truly mass medium, providing both news images and dramatic entertainment in a very particular setting. Even without overt propaganda films, individual picture houses or cinema chains could in their choice of films, music and other elements of their programmes present the war in ways that influenced the popular audience that governments needed to prosecute the war. If the Irish popular audience was indeed crowding the quays waving off Irish soldiers, it seemed likely that they would return to the picture houses to cheer on the screen’s shadow soldiers. “Belgian War Scenes.” Advertisement. Dublin Evening Mail 24 August 1914: 2. Condon, Denis. “Receiving News from the Seat of War: Dublin Audiences Respond to Boer War Entertainments.” Early Popular Visual Culture 9:2 (May 2011), pp. 93-106. H. R. W. “Music and the Drama: War and the Drama.” Dublin Evening Mail 3 Aug. 1914: 2. —. “Music and the Drama: The Invasion of the Film.” Dublin Evening Mail 27 Jul. 1914: 4. The Man About Town. “Cineanachronisms.” Evening Herald. 13 Aug. 1914: 2. Paddy. “Pictures in Ireland.” Bioscope 13 Aug. 1914: 673-5. 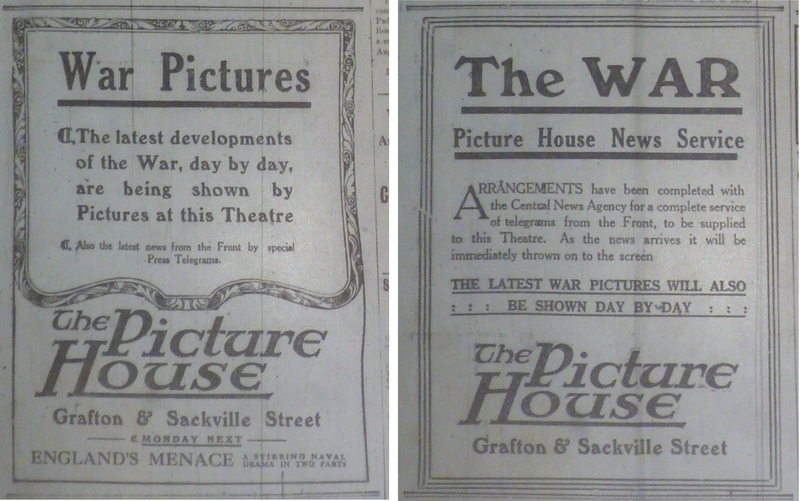 “The War: Picture House News Service.” Advertisement. Dublin Evening Mail 12 Aug. 1914: 2. Ad for the opening of the Bohemian Picture Theatrre. Dublin Evening Mail, 6 Jun. 1914: 7. “Glasnevin has fallen into line – it has not merely one Picture House, but two. Handsome buildings they are, both of them,” observed the Evening Herald’s Man About Town at the end of May 1914. He also noted developments in cinema far from Dublin, in the west coast Aran Islands: “Kilronan, Islands of Arran, too, has ‘joined the movement.’ Kilronan people to the number of 400 turned in on Saturday week last to their Picture Palace, and, as our Arran correspondent adds, ‘thoroughly enjoyed the films shown’” (“Thing Seen and Heard”). However accurate may have been his intriguing information on cinemagoing on islands far from the city that was his beat, he was wrong about the location of the two new Dublin picture houses; they were in the north-city district of Phibsborough, a mile from the more remote village of Glasnevin. 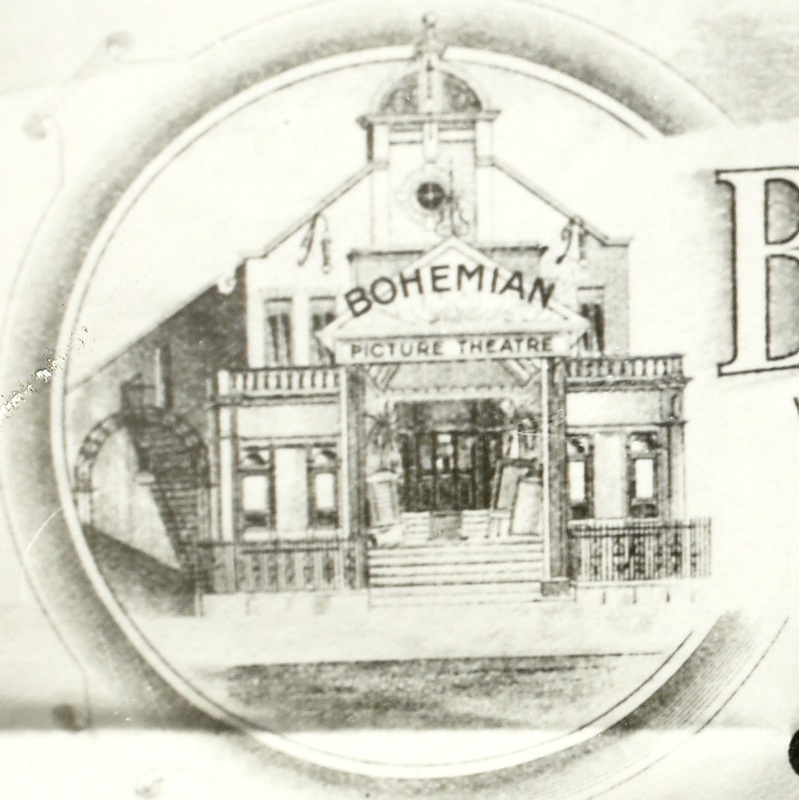 Letterhead from 1916 featuring image of Bohemian Picture Theatre. Courtesy of the National Library of Ireland. 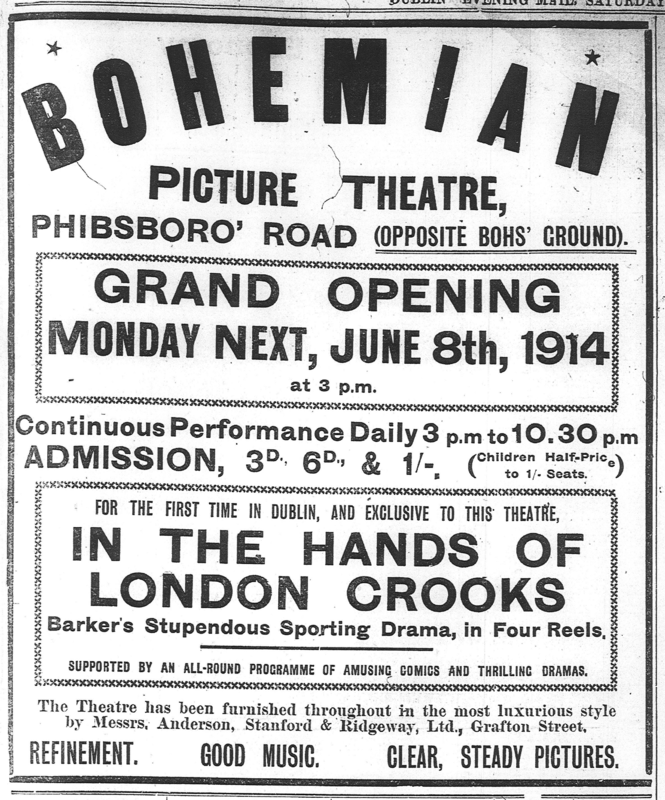 On 9 June 1914, the Irish Times somewhat more accurately reported that the “Bohemian Picture House, in Phibsborough road, was opened yesterday afternoon under conditions which promise well for the future success of the entertainment given there” (“Bohemian Cinema”). The location was right here, as the Bohemian – taking its name from the local soccer club – was built on the site of two demolished houses at 154 and 155 Phibsborough Road. However, as the controversy over the recently opened Phibsboro Picture House’s showing of In the Shadow of the Throne continued into the week beginning 8 June, conditions looked a little less auspicious than the writer would have his/her readers believe. The British trade journal Bioscope’s detailed account of the incident only appeared on 11 June, describing it as “A Catholic Protest” that had been counterproductive because it had “evoked a desire in other people to see [the film] and judge for themselves” (“‘In the Shadow of the Throne’). Two small shops flanked the entrance to the Bohemian, which was approached by a set of steps. Nevertheless, both the Times and Herald rightly agreed that the Phibsborough picture houses were handsome, well-equipped buildings. The plans for the Bohemian were drawn up by Dublin’s most prominent cinema architect, George L. O’Connor. Having already prepared the plans for the Mary Street Picture House and the Rathmines Picture Palace (opened in March 1913 and soon afterwards named the Princess), O’Connor was said to be making “a speciality of designing cinema theatres” (“Another New Cinema Theatre for Dublin”). His design for the Bohemian resembled that of the Rathmines Picture Palace in incorporating two shops on either side of the entrance, each only a single storey in order not to block the view of the theatre itself (“More Cinema Theatres for Dublin”). The facade was “finished in red brick and chiselled limestone dressings, gables and finials” (“Building News”). Although set back from the street, the picture house announced itself with a canopy that extended between the shops. Patrons entered the auditorium by climbing a set of steps to the lobby. Inside, a wide stairs led to a spacious gallery, while an auditorium 104 feet by 38 feet was furnished with seats and carpets in shades of blue and topped by an elliptical ceiling finished in decorative fibrous plaster (ibid). the film is entirely enclosed throughout its length, thus giving complete immunity from fire risks. From lens to screen is a distance of 105 feet, and the screen, 20 feet by 15 feet, is slightly inclined from the vertical in order to give a proper view from every part of the house (“Bohemian Cinema”). “The Bohemian Boy”: Caricature of Bohemian owner Frederick Sparling. Irish Limelight Aug. 1917: 1. The 24-year-old Bohemian owner Frederick Arthur Sparling chose to compete with the more experienced proprietors of the Phibsboro Picture House located just 50 yards away with a very similar entertainment. Both venues offered continuous performances from 3 to 10:30, but the Boh’s prices of 3d, 6d and 1s were slightly higher than the Phibsboro’s 3d, 6d and 9d, and on Sundays, the cost of 3d seats increased to 4d. The ad for the Boh’s opening promised “refinement, good music and clear, steady pictures,” with its programme for the first six days headed by the four-reel British racing drama In the Hands of London Crooks (Barker, 1914). On Sunday 14 June, the main film was the two-reel In the Grip of Circumstance (US: Essanay, 1914), followed on Monday, 15 June, by Lieutenant Daring and the Stolen Invention (Britain: British and Colonial Kinematograph, 1914), and on Thursday, 18 June by The Drudge (US: Vitagraph, 1914). Sparling likely left the choice of “exclusive” films to his manager W. O. Ashton, who had recently been working for the Dublin branch of the distribution company Films, Limited (Paddy,18 Jun.). Musical director Percy Carver supervised the accompaniment, which “plays during the whole of the performance” (“Bohemian Picture Theatre”). 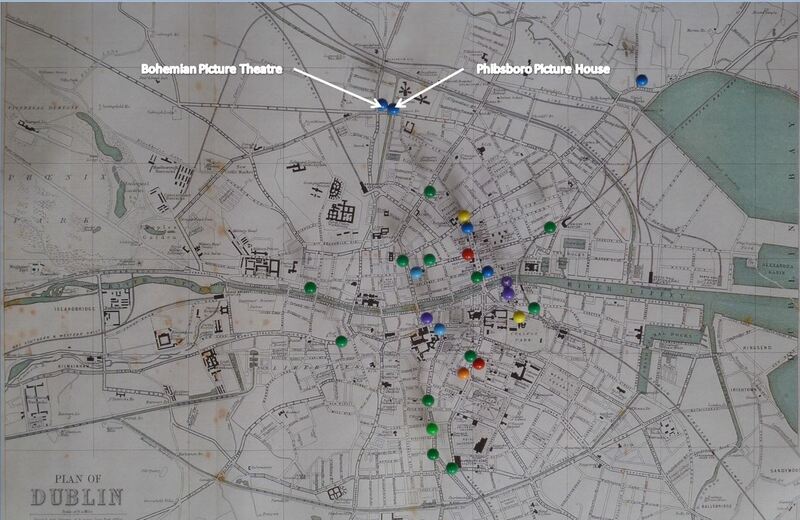 Map showing the main Dublin picture houses and theatres showing films by 1914, with the location of the Bohemian and Phibsboro indicated. The Times put the number of seats at 900, while other sources estimated 860 (“More Cinema Theatres for Dublin”), 1,000 (“Building News”) and 1,200 (Paddy, 4 Jun.). Taking even the lowest estimates for the two Phibsborough picture theatres (the Phibsboro with 570 and Bohemian with 860), early June 1914 saw this suburb on the northern edge of the city gain more than 1,400 cinema seats in just over two weeks. To ensure healthy profits, the picture houses would have had to have induced patrons to travel to Phibsborough, perhaps on one of the two tram lines that served the area. This was an extraordinary development because it showed the degree to which cinema had changed the entertainment geography of the city by bringing professionally produced theatrical entertainment into the suburbs. “Another New Cinema Theatre for Dublin.” Irish Builder 31 Jan. 1914: 72. “Bohemian Cinema.” Irish Times 9 Jun. 1914: 5. “Bohemian Picture Theatre,” Dublin Evening Mail 13 Jun. 1914: 3. “Building News.” Irish Builder 19 Dec. 1913: 868. “‘In the Shadow of the Throne’: A Catholic Protest.” Bioscope 11 Jun. 1914: 1106. “More Cinema Theatres for Dublin.” Irish Builder 16 Aug. 1913: 536. Paddy. “Pictures in Ireland.” Bioscope 4 Jun. 1914: 1069; 18 Jun. 1914: 1261. “Thing Seen and Heard: Glasnevin.” Evening Herald 25 May 1914: 5. Announcement of the opening of the Phibsboro Picture House, Dublin Evening Mail, 23 May 1914. 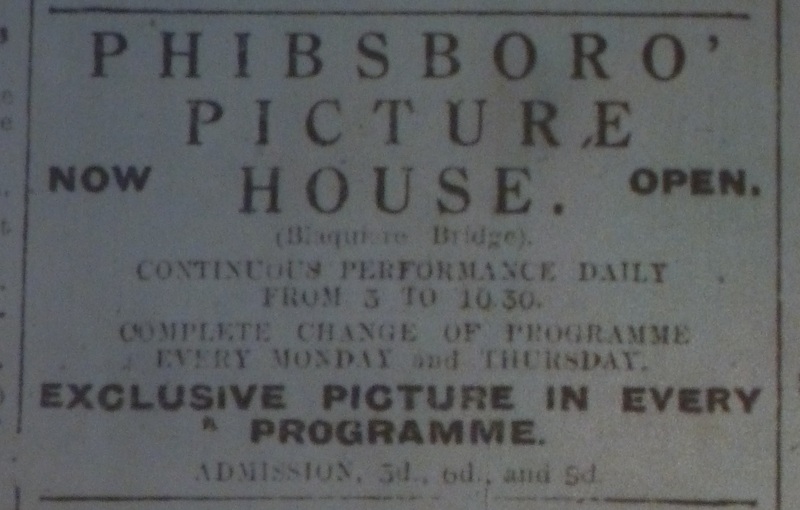 A century ago, on 23 May 1914, Dublin’s newspapers announced the opening of the Picture House in Phibsborough (or Phibsboro), on the northern edge of the city. The papers are a little vague on the exact day of the opening, but as the 23 May was a Saturday, some of the papers cover the opening in their weekly theatrical column. “The grand opening of the new Picture House situated at Blaquiere Bridge, Phibsborough,” declared the Dublin Evening Mail’s The Play’s the Thing column, “took place this week, with signal success” (“New Picture House in Phibsborough”). That morning’s Irish Times had carried the same article, and a shorter notice in the Evening Herald was clearly working from the same publicity material provided to the Mail and Times. “The promoters deserve every congratulation, not only as regards the excellent film presented, but also in as far as design, furnishing, lighting, ventilation, etc., are concerned,” commented the Herald. “The house is most comfortable, and great crowds have been enjoying both the comfort and excellent fare provided. 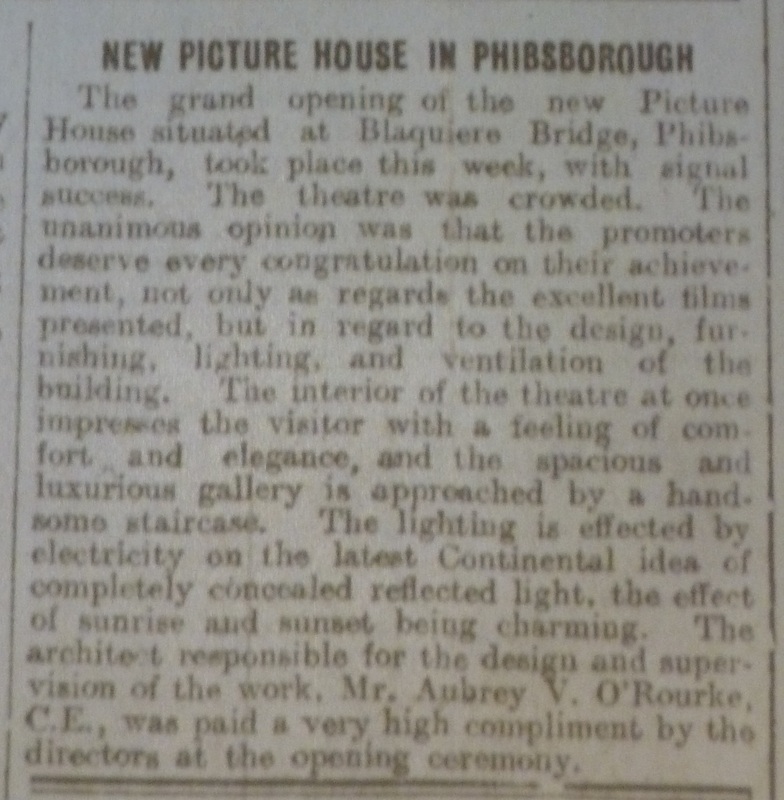 The architect, Mr. Aubrey V. O’Rourke, C.E., was paid a very high compliment by the directors at the opening ceremony” (“New Phibsborough Picture Palace”). The only known photo of the Phibsboro Picture House was taken after it had closed for demolition in 1953 (http://archiseek.com/2012/1914-phibsborough-picture-house-north-circular-rd-dublin#.U38HxCjiiI8). Certainly, the only still circulating photograph of the original facade – taken almost 40 years later – shows an attractive addition to the streetscape in this part of the city. Construction work had begun in summer 1913, but even after this had started, alterations were made to the design, probably in order to better compete with the Bohemian Picture Theatre, which was also under construction close by on Phibsborough Road. “It is intended to amend the design and planning generally of the new cinematograph theatre now in the course of construction at Madras Place, Phibsboro’,” revealed the Irish Builder. City councillor and former mayor, John J. Farrell already had interests in the Electric Theatre, Talbot Street, the Mary Street Picture House and the soon-to-be announced Pillar Picture House in O’Connell Street. For the Phibsboro venture, however, Farrell registered the Phibsboro Picture House company on 2 September 1914, in partnership with William King, a farmer and horse breeder of Belcamp, Co. Dublin; and British cinema owners Henry Hibbert and T. Wood (“World of Finance”). Construction on the Phibsboro – and all other Dublin buildings – stopped in September 1913 because of the Lockout (Paddy, 30 Oct. and 11 Dec.), but it resumed with the end of the general strike in early 1914. Advertisement for the newly opened Phibsboro Picture House, Dublin Evening Mail, 23 May 1914. The main film Paddy saw that night was Lieutenant Rose and the Sealed Orders (Britain: Clarendon, 1914) “and it was followed with intense interest by a packed house,” as well as the John Bunny comedy Bunny’s Mistake (US: Vitagraph, 1914) and The Vanishing Cracksman (US: Ediston, 1913). In the Shadow of the Throne at the Phibsboro; Dublin Evening Mail 30 May 1914: 4. The first film that the Phibsboro actually advertised was the Danish film I Tronens Skygge, translated as In the Shadow of the Throne (I Tronens Skygge; Denmark: Kinografen, 1914). It was due to run for three days beginning on Monday, 1 June, but its opening had some unintended consequences, many – but not all – unpleasant for the management. The film caused a campaign by members of the Catholic Church’s Vigilance Committee, which had been formed in 1911 to campaign against “evil” literature but which had developed a campaign against theatre shows and films. Part of this campaign involved protests in theatres and cinemas carried out by William Larkin and his twin brother Francis. The campaign began when P. Donnelly sent a letter to the Freeman’s Journal complaining about the film and asking “How long is Catholic Dublin going to stand this sort of thing?” (“A Cinematograph Show Objected To,” Condon 228). Donnelly objected to the fact that a nun said Mass and that a newly professed nun fell into the arms of a prince. The controversy caused a range of reactions. John J. Farrell responded by retaining the film for the second half of the week, writing a letter to the Freeman contradicting Donnelly’s claims (and perhaps, as alleged in court, threatening legal action if the paper did not print a retraction), and inviting a reporter from the newspaper to give an “objective” assessment of the film. The resulting publicity brought around 600 Dubliners, the seating capacity of the cinema, to subsequent showings of the film. Among these on Friday were William and Francis Larkin, who ended a shouted protest in the auditorium by throwing ink at the screen, splattering the blouse and music of Miss Eager in the orchestra. The Larkins were arrested, found guilty and fined a nominal 5 shillings, a punishment whose leniency suggested – not for the first time – the tacit support of the magistrate for Vigilance Committee activities. To devote too much attention to the Larkins is to turn away from the story of the cinema, but the newspaper accounts of the case provide details of the working of the Phibsboro that do not survive otherwise. They reveal the name of the attendant Daniel McEvoy, whom William Larkin accused of handling him roughly while removing him, and also two women musicians from the orchestra who would otherwise be anonymous: Miss Eager, the musical director whose blouse was inked, and Miss Duffy, who testified in court. Daniel McEvoy and Miss Eager remain obscure, but Miss Duffy is likely to have been Evelyn Duffy who is listed in the 1911 Census as a 23-year-old professional vocalist living at 106 Phibsboro Road, close to the cinema. Just three weeks after it opened, the Phibsboro had become a part of the city in several ways. It had become a significant part of the streetscape of north Dublin, a successful business for Farrell and his partners, and a place of employment for McEvoy, Eager and Duffy. Beyond that, it had become central, if only briefly, in one of Ireland’s cultural controversies. “A Cinematograph Show Objected To.” Freeman’s Journal 2 Jun. 1914: 5. “Building News.” Irish Builder 30 Aug. 1913: 563. “New Phibsborough Picture Palace.” Evening Herald 23 May 1914: 4. 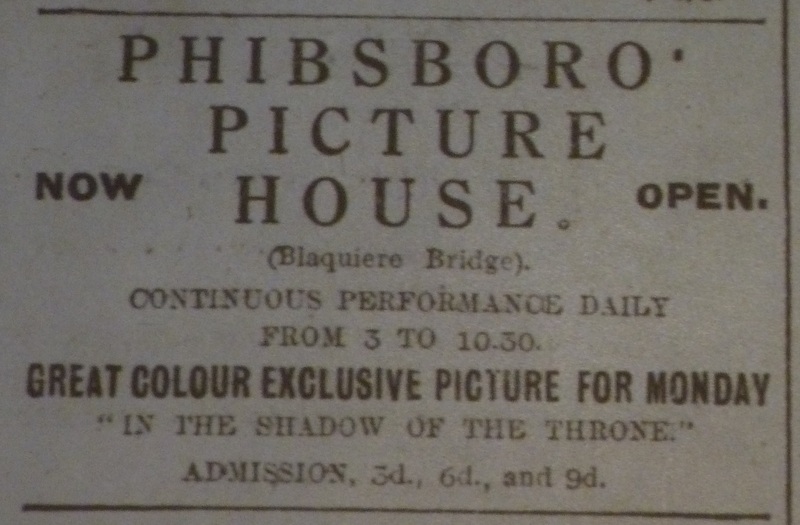 “New Picture House in Phibsboroough.” Dublin Evening Mail 23 May 1914: 3. “Opening of the New Picture House in Phibsborough.” Irish Times 23 May1914: 9. “Our View.” Bioscope 24 Jul.1913: 238. Paddy. “Pictures in Ireland.” Bioscope 30 Oct. 1913: 395; 11 Dec. 1913: 1077; 4 Jun. 1914: 1069. “World of Finance.” Bioscope 18 Sep. 1913: 933. Evening Herald, 28 Feb. 1914: 6. On Saturday, 28 February 1914, Dublin’s Evening Herald published a Gordon Brewster cartoon called “Kinema Kinks” and subtitled “The Demand for Exciting Films Is Becoming Greater Every Day.” It seems that the epitome of exciting films as far as Brewster was concerned was the work of the Essanay company’s co-founder (with George K. Spoor, hence the “S and A”), director and actor Gilbert M. Anderson. Anderson was best known for his most popular screen role of Broncho Billy, and the left-hand panel of the cartoon appears to feature him, with its caption: “A School Boy Thriller // Broncho Bill the Tawny Terror of the Sun-Scorched Sierras in Bite-the-Dust Humour.” The image accompanying this text features a cowboy who has clearly come out best in a shootout with six opponents, on the face of one of whom he is standing, while only the boots of the others are visible. 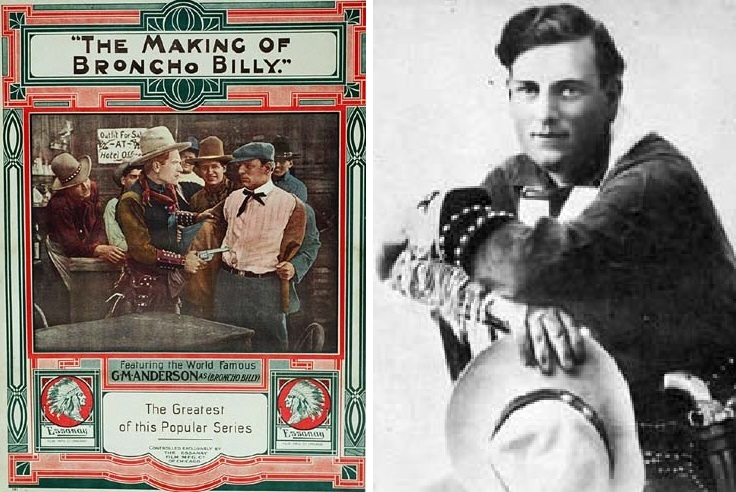 Although the triumphant cowboy’s facial features are not like Anderson’s, it is not just the text that suggests that he is Broncho Billy but also the studded wrist cuffs that were often a part of Broncho Billy’s costume. That said, the second panel – captioned “Alkali Ike Rescues the Fair Damsel // The Above Suggestion May be of Some Use to Cinema Managers” – also features a cowboy with studded wrist cuffs as he hangs from a rope by his teeth carrying the unconscious damsel and holding off what appears to be a knife-yielding Indian. Alkali Ike was the hero of an Essanay series of comic Westerns produced by Anderson and starring Augustus Carney, who may have been born in Ireland. Of what use to cinema managers the image of Alkali Ike might have been is unclear, but the cartoon attests to the popularity of Westerns – not only those of Broncho Billy and Alkali Ike – in Dublin cinemas. As has already been seen here, commentators noted that “no picture programme nowadays is considered complete if it does not include a cowboy film” (“Rotunda Pictures” 9 Sep. 1913). That was an exaggeration; many film programmes did not include a Western. Nevertheless, it suggests that the cinema audience was entirely familiar with Westerns, and in such a situation, it is not difficult to imagine that there was a demand for cowboy film with increasingly sensational scenes. Other kinds of excitement were arranged by the audience rather than cinema managers. Protests in the first week of March 1914 in a theatre and a picture house were indicative of the concerted campaigns of protest in cinemas to come. On the evening of 2 March, William Larkin of 27 Sherrard Street shouted from the gallery of the Gaiety Theatre in protest at the immorality of the French farce Who’s the Lady? (“The Scene at the Gaiety”). He created enough of a disturbance that the actors left the stage until Larkin was removed from the theatre and arrested. Larkin appeared in the Southern Police Court the following morning, where the case against him was dismissed by the magistrate, Thomas Drury, who praised Larkin for having “done a public service” (ibid). Emboldened by this support from the judiciary, William Larkin and his twin brother Francis would in the coming months constitute the most publicly visible part of the Catholic Church-based Dublin Vigilance Committee’s campaign for film censorship with a series of protests in cinemas around the city. For this, they could rely on an at-least tacit but often explicit consensus on the regulation of popular theatre and cinema among the Catholic establishment in the city. The diary of theatregoer Joseph Holloway is revealing on the protests and middle-class Catholics’ attitudes to them. Holloway had not been in the theatre that night, but he followed the controversy in the newspapers. Noting the remarks by the Irish-Ireland journal The Leader that “[a] certain ‘highly respectable’ class of people in Dublin like dirty plays & dirty papers … but in a very literal sense there is a well-dressed ‘Dirty Dublin.,’” Holloway agreed that “[t]his is all very true[;] I have noticed it for years in our theatres that the more questionable the play the better dressed the audience!” (Holloway 504). Although Larkin’s militant policing of respectability had not quite reached the picture houses in March 1914, other kinds of protest had. Between 8 and 9 o’clock on the evening of Thursday, 5 March, fourteen boys of Na Fianna Éireann – or the National Boy Scouts as most of the newspapers called them – were ejected from the Picture House, Sackville/O’Connell Street for disrupting a screening of the British Army Film (Britain: Keith Prowse, 1914) (“Dublin Picture Palace Scene”). While Larkin was interested in morality, Na Fianna were interested in nationality, expressed as anti-British and pro-Irish: “They took up seats in the front rows, and hissed the scenes that were being shown. The cheered for Germans and Boers, and sang ‘A Nation Once Again’” (ibid). They did not have it all their own way, as other members of the audience cheered the British, and the police and cinema attendants dragged several of them from the auditorium. Nevertheless, as Who’s the Lady? 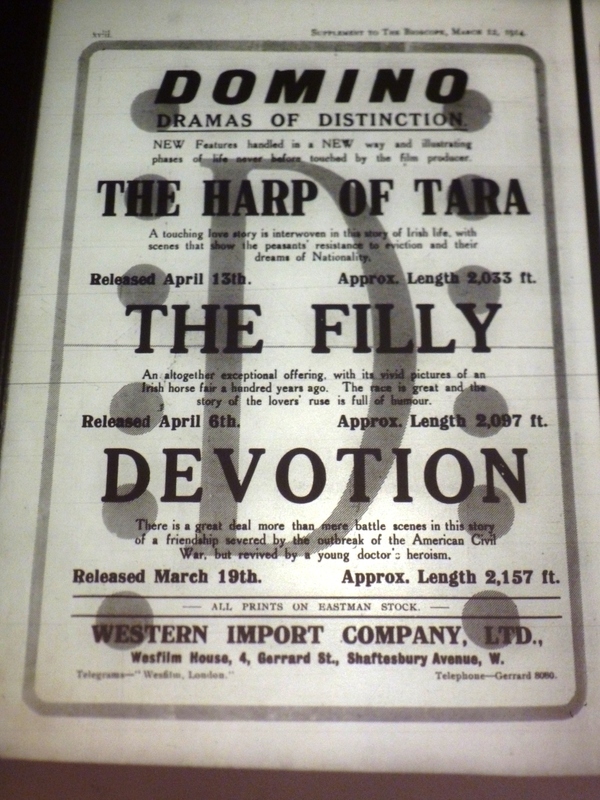 provided the occasion for Larkin’s display of Catholic morality, the British Army Film allowed Na Fianna to project Irish nationalism onto an ostensibly British patriotic text. Joseph Holloway was thus able to point out that the “film also caused a disturbance on last Monday night – The British Army is not to the taste of all people in Dublin” (Holloway 500). While the DVC and Na Fianna seemed intent on placing strict limits on cinema, “famous Irish painter, author, and visionary poet” A.E. insisted – albeit somewhat reluctantly – on the importance and inevitability of cinema in education (Paddy, 19 Feb.). “[F]or all our qualms, we invite the cinema into education,” the Bioscope’s Irish correspondent Paddy reported him as saying. A.E.’s approach was very different in this regard to Ireland’s most famous visionary poet, W. B. Yeats, who had no time for cinema. By contrast, A.E. was, knowingly or not, contributing to an ongoing debate in the cinema industry worldwide on the new medium’s role not only in entertainment but also in the more sober discourses of education, technology and science. He was not the only or even the best know Irish writer doing this. Comments by George Bernard Shaw would open the Bioscope’s Education Supplement on 18 July 1914. 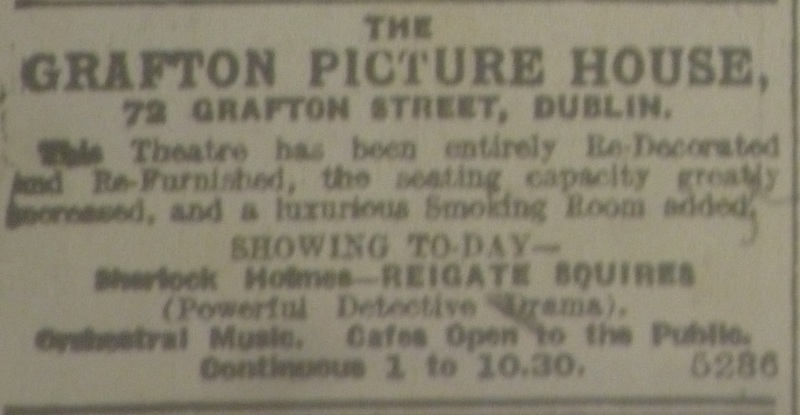 Ad for the reopening of the Grafton Picture House emphasizes the increased luxury of the premises alongside the latest film offering in the Sherlock Holmes series. Evening Herrald 26 Feb. 1914: 4. It was acceptable in Ireland in 1914 to indulge in an excitement that marvelled at the technologies and skills that allowed a Blackrock audience to witness that evening an event – itself a technological marvel of the age – that had occurred in Belfast just that afternoon. Less acceptable and in need to disciplining to pass the dominant modes of respectability, however, were the kind of excesses of violence and sensation depicted by Brewster’s “Kinema Kinks” cartoon. “Dublin Picture Palace Scene: Fourteen Youths Ejected.” Evening Herald 6 Mar. 1914: 2. Filming the Britannic: How ‘Topicals’ Are Produced: While Dublin Sleeps.” Evening Herald 27 Feb. 1914: 2. Holloway, Joseph. Holloway Diaries. National Library of Ireland. 5 Mar. 1914: 500, and 6 Mar 1914: 504. Paddy. “Pictures in Ireland.” Bioscope 19 Feb. 1914: 783, and 12 Mar. 1914: 1133. “Rotunda Pictures.” Dublin Evening Mail 9 Sep. 1913: 5. “The Scene in the Gaiety Last Night: ‘Who’s the Lady?’ Objected to by Young Man: Case Dismissed: Magistrate Says It Was a ‘Public Service.” Evening Herald 3 Mar. 1914: 1. On 25 November 1913, Dublin’s Evening Herald reported that haulier Sidney Norman of Neath, Wales, had seriously injured himself in the early hours of the previous Saturday when he had jumped ten feet from his bedroom window while dreaming he was escaping from robbers he had seen that evening on a picture theatre screen (“Man’s Leap to Escape Cinema Robbers”). For this ordinary Welshman, the images on the screen had literally become the landscape of his dreams, to his severe bodily cost. The Herald picked this up as a news oddity and published it on its front page, where its readers might wonder at the gullibility of some picture-house patrons or the need to control this new entertainment that was coming to increasingly direct the dreams of its audience. One of the ways in which it did this was through films of greater length and complexity. The increasing length of films had been a particular issue in the film industry since 1911. “We can remember when a drama of 1,000 ft. was often grumbled at on account of its length,” noted an editorial in the British cinema trade journal Bioscope in September 1911, “but it seems as if that day were past, and the demand for a picture play constituting the usual length of an entire programme has sprung up (“The Length of the Film”). The film of 1,000 feet (about 16 minutes at 16 frames a second) was the standard product of the US distributors, but in Europe, longer films, often with high-cultural prestige such as Italian company Cines’s 1913 Quo Vadis?, captured both the imagination of the public and the film market where they were sold as features or exclusives. An unusually large ad for an unusually long film: Evening Herald banner for The Three Musketeers at the Phoenix, 15 Nov. 1913: 4. “From Manger to Cross,” “Quo Vadis?” “Monte Cristo,” “The Battle of Waterloo,” etc., have all been shown at the Phoenix within the last few months. Last evening the patrons of this popular house had presented to them the longest film yet shown in this country – the “Film D’Art’s” remarkable production of Dumas’s popular and widely read work, “The Three Musketeers” (“‘The Three Musketeers’”). This issue of the long film was not resolved in 1911, however, and the Bioscope continued to favour a varied programme of shorter films, arguing in an October 1913 editorial that the long film’s “charm and importance can be better sustained outside the ordinary picture theatres. The popularity of the cinema has been built up on the variety of the entertainment it offers, and a lessening of that variety means a weakening of public interest” (“Exclusives and Other Matters”). Doubtless, the Bioscope was influenced in its thinking by the nature of variety theatre, cinema’s chief rival in popular entertainment in Britain, Ireland and elsewhere. A solution to providing a lengthy film as part of a variety programme was available in another popular form: the serial. Fictional writing had long been serialized in newspapers and magazines, where it appeared alongside many other kinds of writing in another kind of variety format. In November 1913, the Evening Herald carried an episode of popular novelist Emma M. Mortimer’s Robert Wynstan’s Ward each day, and this was wholly unremarkable. However, the autumn of 1913 saw a new phenomenon arrive in Ireland: the film serial. When the Rotunda began showing the serial What Happened to Mary in September 1913, the Dublin Evening Mail commented that the Rotunda “management in producing a ‘serial’ film, have broken new ground as far as Dublin picture houses are concerned” (“Rotunda Pictures” 23 Sep.). Unlike the Phoenix, the Rotunda favoured a more varied programme of shorter films, so that when High Tide of Misfortune, the tenth episode of What Happened to Mary, was exhibited there in the week of 24-29 November 1913, it shared the bill with the main film, Broken Threads United; a “very complete picture […] of the procession to Glasnevin on Sunday in connection with the Manchester Martyrs’ commemoration”; the comedies His Lady Doctor, Ghost of the White Lady and Love and Rubbish; and the Pathé Gazette newsreel (“Rotunda Pictures” 25 Nov). The serial was integrated into this variety film programme that was lent some locally produced coherence by being accompanied by the music of the Irish Ladies’ String Orchestra. To what degree the variety format was more successful in attracting a larger and more diverse audience is debatable, but the inclusion of What Happened to Mary seemed a direct appeal to young women. Narrating the adventures of a country girl who comes to the city, What Happened to Mary was produced by Edison in twelve monthly episodes beginning in US picture houses in July 1912 in parallel with the serialized story that appeared in the US mass-circulation women’s magazine Ladies’ World, making its lead actress Mary Fuller into a star (Singer 213). Running from 22 September to 13 December, the first Irish exhibition at Dublin’s Rotunda tied in with its weekly serialization in the British women’s magazine Home Chat (“The Rotunda,” “The Picture Houses”). As such, it was clearly marketed primarily at women. An indication of its local success is the fact that the Rotunda immediately followed it with Who Will Marry Mary?, the Edison sequel, which again featured Mary Fuller. Although it would take another year for the serial to reach the height of its popularity with such “serial queens” as Helen Holmes the adventurous heroine of The Hazards of Helen and Pearl White in The Perils of Pauline and The Exploits of Elaine, this earlier serial followed some of the patterns of the later ones. Shellley Stamp argues that “for a complete understanding of the template serial heroines offered viewers we must look beyond the screen exploits of Pauline and her compatriots towards the substantial star discourse that circulated around the actresses who played these women on screen” (Stamp 217). Some of the Dublin reviews suggested What Happened to Mary did create the desire in its audiences for more information about Mary Fuller: “‘Alone in New York’ is the second instalment of the ‘What Happened to Mary’ serial; all who have seen the opening scenes of Mary’s adventures will be eager to know more about this fascinating actress” (“Rotunda Pictures” 27 Sep.). An Irish flapper finds space for herself in the public sphere; Irish Life 24 Oct. 1913: 91. More specific information on the reception of What Happened to Mary among Irish audiences, and particularly Irish women, does not seem to survive. The fact that the exhibition of the film was tied to the publication of a British magazine is indicative of the subsidiary place of Ireland in the publishing and film industries. The Irish women’s magazine Lady of the House, which had very little to say about cinema of the period, made no mention of the serial, but it and other Irish periodicals show how women were represented in popular media. Was the young flapper shown travelling on a tram in a cartoon in the glossy and expensive Irish Life in October 1913 likely to have found Mary’s adventures or Mary Fuller’s star persona enthralling? Perhaps, but it is not clear that the serial form allowed Mary Fuller to capture the imagination of the public to a greater extent than the at-least-sometimes more active heroines of stand-alone films. In the Herald’s notice for the Rotunda on 30 September, the third episode of What Happened to Mary was not mentioned, but the reviewer focused on the heroine of A Wild Ride, set on a South African ostrich farm, in which “a resourceful and up-to-date heroine, in a situation of dire extremity, outwitted cunning and ferocious savages, rode an ostrich across the trackless veldt at high speed, and brought soldiers to the relief of her imprisoned family” (“Rotunda Pictures” 30 Sep.). Such derring-do in the serial would await The Hazards of Helen, which would not hit Dublin screens until 1915. Other kinds of film serial followed quickly on the heels of What Happened to Mary and offered different forms of fascination – whether that be attraction or repulsion. Sharing the bill at the Rotunda with A Proposal Deferred, the fifth episode of What Happened to Mary in the week beginning 20 October was the second part of Gaumont’s five-part Fantômas (1913), each of which contained three to six episodes. Directed by Louis Feuillade and based on a popular series of 32 French novels by Pierre Souvestre and Marcel Allain that were published in monthly instalments between February 1911 and September 1913, the films followed the early exploits of the eponymous super villain as he terrorizes Paris (Walz and Smith). “Those who go to the Rotunda this week will, at any rate, get plenty of sensation,” observed the Irish Times. The film, “Fantomas,” is a choice blend of mystery, tangled plot, and blood-curdling enterprise. It is not easy to grasp all the bearings of the incidents or their mutual relationship. The film, however, introduces us to some remarkable phases of Paris life and its institutions. And the glimpses of the city’s streets and parks are always full of interest. It is very admirably acted by all the characters (“Rotunda Living Pictures”). Unlike What Happened to Mary, Fantômas did not appear on a reliable weekly or even monthly basis that might establish a loyal pattern of attendance. Nevetheless, even if not regular, Fantômas was popular, and the Rotunda continued to premiere the new parts as they were released, showing The Tragedy at the Masked Ball over the Christmas period of 1913 and the fifth part, The False Magistrate, in June 1914. These serials were not restricted to city audiences but travelled on the important Irish Animated Picture Company exhibition circuit established by James T. Jameson of the Rotunda. In his praise of Jameson in January 1914, the Bioscope’s Irish correspondent Paddy revealed that two of the What Happened to Mary episodes had recently been seen around the country: A Proposal Deferred had been at Tralee, while the twelfth and final episode, Fortune Smiles – receiving “considerable applause” – was on the programme at Galway. The YMCA hall in Queenstown was showing the fourth part of Fantômas, The Tragedy at the Masked Ball (Paddy). As such they came, no doubt to inhabit the dream and nightmare worlds of many Irish people. Birchland, Robert. “What Happened to Mary?” Hollywood Heritage 18: 2 (Fall 1999). Hollywoodheritage.org. http://hollywoodheritage.org/newsarchive/Fall99/Mary.html. 19 Nov. 2013. “Exclusives and Other Matters.” Bioscope 9 Oct 1913: 87. “The First Movie Serial.” 100 Years Ago Today. http://100yearsagotoday.wordpress.com/2012/07/26/the-first-movie-serial/. 19 Nov. 2013. “The Length of the Film: A Question of Policy.” Bioscope 7 Sep. 1911: 471. “Man’s Leap to Escape Cinema Robbers.” Evening Herald 25 Nov. 1913: 1. Paddy. “Pictures in Ireland.” Bioscope 22 Jan. 1914: 351. “The Picture Houses: Rotunda Pictures.” Evening Telegraph 30 Sep. 1913: 2. “Pictures at the Rotunda.” Freeman’s Journal 21 Oct. 1913: 9. “The Rotunda.” Irish Times 23 Sep 1913: 5. “Rotunda Living Pictures.” Irish Times 21 Oct. 1913: 5. “Rotunda Pictures.” Dublin Evening Mail 23 Sep. 1913: 3. “Rotunda Pictures.” Evening Herald 27 Sep. 1913: 9. “Rotunda Pictures.” Evening Herald 30 Sep. 1913: 5. “Rotunda Pictures.” Dublin Evening Mail 21 Oct. 1913: 2. “Rotunda Pictures.” Evening Herald 25 Nov. 1913: 5. Singer, Ben. Melodrama and Modernity: Early Sensational Cinema and Its Contexts. New York: Columbia UP, 2001. Stamp, Shelley. “An Awful Struggle Between Love and Ambition; Serial Heroines, Serial Stars and Their Female Fans.” The Silent Cinema Reader. Ed. Lee Grieveson and Peter Krämer.London: Routledge, 2004. “The Three Musketeers’” Evening Herald 18 Nov. 1913: 5. Walz, Robin, and Elliott Smith. Fantômas. http://www.fantomas-lives.com/fanto6.htm. 28 Nov. 2013. “One aspect of the strike which has probably not been brought home to the public,” begins a tantalizing article in the Evening Herald on 18 October 1913, “is the effect which it has had upon the amusements of Dublin, such as theatres, music halls, and cinematograph shows” (“Dublin Theatres and the Strike”). Despite offering the views of prominent – albeit unnamed and paraphrased – theatre, music hall and cinema managers, the almost 700-words that follow are, if intriguing, also finally frustratingly unspecific. This is not because as a newspaper owned by employers’ leader William Martin Murphy, the Herald missed few opportunities to point out the folly of Dublin’s striking workers, who had been, it often argued, criminally led astray by union leader Jim Larkin. There are traces of that editorial line here, but the real disappointment is that the writer appears misleadingly to conceive each of these entertainments as being entirely identified with a single class. This, then, looks gratifyingly like a suitable case for analysis and supplement. firstly, that inasmuch as the earning capacity of some thousands of men has been stopped, therefore their spending capacity has likewise been curtailed. Secondly, that where the earnings have not been interfered with, among those who are not directly concerned with the strike, yet who live some considerable way from the city, they have been unable to patronise the various entertainments provided for their amusement owing to the difficulties of travel consequent upon the curtailment of the tramway programme (ibid). A large number of workers with severely reduced income and restrictions on public transport were undoubtedly key factors affecting audience numbers, but the article is less convincing in the argument it makes about the identification of entertainments with particular classes. had suffered considerably, the seats of these houses, whilst altogether more expensive than those of cinematograph shows were cheaper than those of the theatres, so that whereas the man who would pay three or four shillings for a seat at the theatre would and could afford the cost of a conveyance to and from his residence[, t]he man who came from the outlying parts could not, and it is too far to walk a couple of miles each way (ibid). The difference in ticket prices here seems to create a rigidly stratified system. Stratification based on price, class and type of entertainment certainly existed but not in the way implied here. It is too much of a simplification to state that theatregoers were substantially of a class that could in the absence of trams due to the strike, afford private transport or a cab, while music hall patrons were from a class that lived in the suburbs (to a degree that severely impacted on the business of music halls) but could not afford to pay both for admission and transport home. But the argument become particularly problematic in relation to cinema. In the poorer parts of the city where the cheaper cinematograph shows abound, these have been directly affected by the loss of custom consequent upon those who patronise them being strikers, and therefore, not earning any money. Some of these have suffered severely, and their owners and managers will be very pleased when the strike is settled (ibid). Certainly the business of picture houses located in working-class areas was affected by the Lockout, but which ones the writer had visited or was thinking of is unclear. 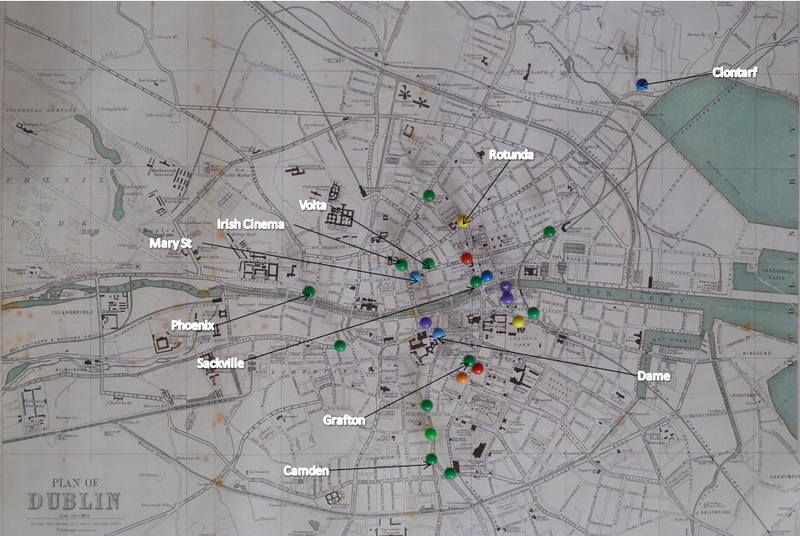 Map of Dublin in 1913 with pins indicating locations of picture houses, music halls and theatres. The controversy over the Sunday opening of picture houses suggested that going to the pictures was not just a working class entertainment. On 24 October 1913, the Recorder of Dublin – the city’s chief magistrate – considered an application for a Sunday music licence for the Dame Street Picture House, without which it could not open. From their previous applications in April and July 1913, the proprietors of the Dame Street Picture House knew the authorities’ views that the Grafton and O’Connell Street picture houses “were frequented by persons of the better class, and there was no necessity that they should be opened on Sundays for their benefit” (CSORP/1915/2211). As a result, the proprietors argued that the “people who frequented the Grafton street house were generally people who went shopping. The Dame street house was frequently largely by the working classes, and the object of the application was to give facilities to the working classes to attend performances on Sundays” (ibid). They classed themselves among the picture houses that were allowed to open on Sunday: the Phoenix Picture Palace, the Irish Cinema in Capel Street, the Dorset Picture Hall, the Camden Picture House, the Theatre de Luxe in Camden Street, the Picturedrome in Harcourt Road, the Brunswick Street Cinema, the Princess Cinema in Rathmines, the Mary Street Picture House, the Volta in Mary Street, the World’s Fair Varieties in Henry Street and the Electric Theatre in Talbot Street (ibid). Ads for Sunday shows at Phoenix and, despite the Recorder’s ban, the Dame; Evening Telegraph 25 Oct. 1913: 4. The Recorder did not accept this, contending that Dame Street was one of the city’s principal streets – “near the residence of the King’s representative” in Dublin Castle – and not located in a working-class district (“Picture Houses”). He therefore treated the picture house there as he did the ones in Grafton Street and O’Connell Street by refusing them a Sunday licence. “He would give every facility to Sunday entertainments for the working classes, but he would not, so far as he could prevent it, give up the principal streets to these syndicates on Sundays” (“Sunday Cinemas”). The Recorder’s licensing session also considered local objections to Sunday shows at Clontarf Town Hall, one of the city’s latest picture houses to open – and so not listed above. When Clontarf was incorporated into an expanded Dublin at the turn of the century, the administrative powers of its local council were assumed by Dublin Corporation, and its town hall had no function. Beginning on 18 July 1913, the hall’s leasee George Humphreys ran it as a picture house, with the proviso that he give it up when the Corporation needed it. “Mr. Robertson, (who represented the police) said that he went to the petty Sessions at Clontarf the other day, and they were held in this picture show (laughter)” (“Clontarf Cinema”). Reverend John L. Morrow, chairman of the Clontarf Citizens’ Association objected to the renewal of the picture house’s licence on the basis that local people had not been consulted on its use for this purpose. He complained in particular that its Sunday shows “brought out an objectionable class from the city” (ibid). Humphreys dismissed this claim, observing that “the hall was patronised by people like Ald. Maguire, of Clontarf; Mr. Brady (solicitor), and many other representative and legal gentlemen” (ibid). By 1913, the picture house no longer provided entertainment only for the working class. “Clontarf Cinema: Citizens’ Association: Raise an Objection.” Evening Telegraph 24 Oct. 1913: 3. CSORP/1915/2211, National Archives of Ireland. “Dublin Theatres and the Strike.” Evening Herald 18 Oct. 1913: 4. 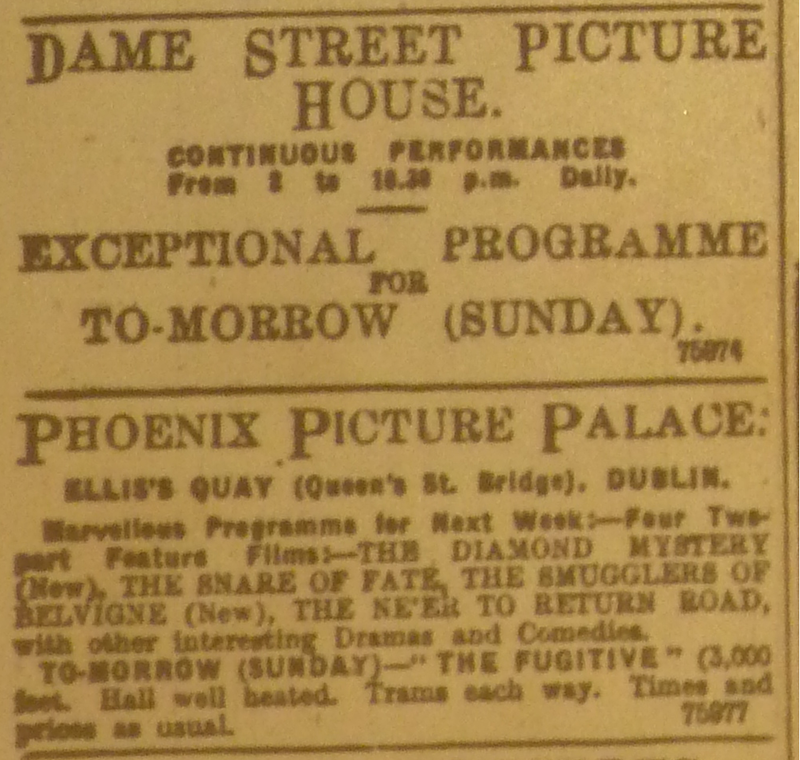 “Picture Houses: And Licence for Sunday Shows.” Evening Herald 24 Oct. 1913: 2. “Sunday Cinemas: In Leading Streets.” Evening Telegraph 24 Oct. 1913: 6.